On Thursday morning, March 16, Ace kicked off its 2017 Spring Convention & Exhibits General Session in Atlanta, Georgia. 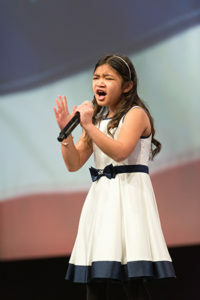 Singer and former Children’s Miracle Network (CMN) hospital patient Angelica Hale delivered a stunning rendition of the national anthem, receiving several minutes of applause from the audience of over 3,500 retailers. In his segment “The Power of the Co-op,” Chairman of the Board Jim Ackroyd greeted attendees and thanked them for their accomplishments. Ace retailers broke a lot of records in 2016, including a 10th J.D. Power Award, a fourth consecutive year of increased transactions, and a 3.9 percent higher gross profit. Ackroyd acknowledged outgoing board members Gina Schaefer and Jeff Girard, and welcomed incoming board member Karen May, executive vice president and chief HR officer of Mondelez International. Ackroyd concluded by announcing CMN All-Star Roxie Schopp. In 2016, Ace stores raised 4.7 million for CMN. Angelica Hale sings the national anthem. President and CEO John Venhuizen adopted a more serious tone. His speech, entitled “Our War for Relevance,” alerted retailers to the growing threat from online commerce. Venhuizen cautioned against the dangers of outdated defensive strategies or, worse yet, complacency. Instead, retailers should focus on the power of Ace’s core traits of service, convenience and quality to combat the impersonal online shopping experience. “Identify the enemy’s weakness and attack it relentlessly,” said Venhuizen, using a historical reference to France’s Maginot line of defense. 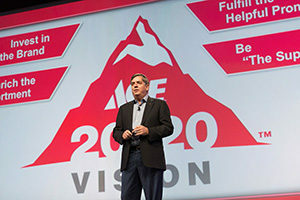 To help drive home the message, Executive Vice President John Surane took to the stage armed with a series of smartphone poll questions. Retailers were asked to rank themselves on a scale of 1 to 10 against big box and online merchants in the categories of service, convenience and quality. Responses were displayed on the stage screen for all to see. Surane then encouraged retailers to visit specific corporate booths that could provide resources for those areas in need of improvement. 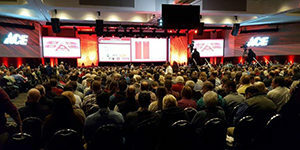 Equipped with their convention attack plan, retailers were invited to “make Atlanta famous” for the offers and opportunities found on the show floor.